No longer forever delayed… | Pulp and Circumstance, Juiced. Last night, P&C reviewer Esteban Miguel strapped back on his live musical boots and straps and got out to review one of his favorite bands, which actually found success on a stateside tour and impressed our humble reviewer into becoming a calisthenics freak? Read on, kitties…. 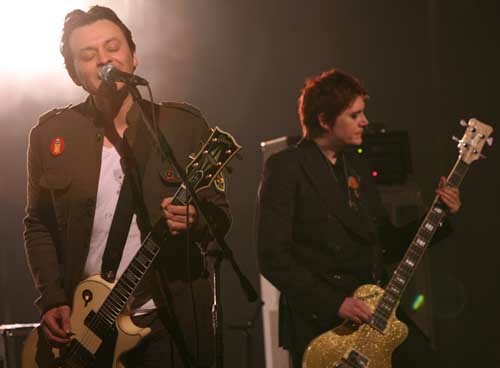 It took several tries but the Manic Street Preachers finally finished a US tour…a fact Bassist Nicky Wire acknowledged toward the end of last night’s concert at the Paradise in Boston, the last stop on the band’s US jaunt. (Nicky Wire also noted his sailor cap might be a “little too Frankie Goes To Hollywood” as well.) Since playing TT the Bear’s sometime in 1992, the Manic cancelled a US tour in the wake of guitarist Richey James’ disappearance (He was never found.) and then failed to play Boston when singer/guitarist James Dean Bradfield fell ill while they were touring their “most commercial album,” This Is My Truth Tell Me Yours, in 1999. The small venue seemed a strange fit for the band. Their earlier material and the more stripped down latest album, Journal for Plague Lovers, seemed to work at the Paradise. But the more orchestral numbers, such as A Design for Life, from their commercial prime seemed a bit out of place. (Not a bad thing, just an observation.) Also noticeable was how strong James Dean Bradfield is as a performer. Richey James’ tragic story and cryptic lyrics and Nicky Wire’s on-stage rants, costumes and calisthenics grab most of the attention. But Bradfield’s ability to turn those lyrics to solid tunes, his fantastically visceral guitar solos and rich voice (despite a cold last night) are what make the band A-Leaguers in their home country. And despite being relative minor leaguers in the US, the Manic Street Preachers were still greeted with a lot of diehards who either waited all those years to see them or traveled across the pond to experience them in a smaller venue. The band’s albums aren’t too easy to find here in the States, if they even see a US release, but the crowd apparently knew every word to every song, even helping Bradfield out when his cold got in the way. The setlist was actually a pretty comprehensive survey of the band’s catalogue. While they played four tracks off their latest, Journal for Plague Lovers, which was written using lyrics left behind by Richey James, they also played four songs off their 1992 debut, Generation Terrorists, including the opener, Motorcycle Emptiness. Their biggest hits (A Design for Life, If You Tolerate This Your Children Will Be Next) were also played with A Design for Life serving as a rousing singalong to close the set. In that moment, as they performed their signature song, the band got the adoration they’ve been seeking stateside for almost two decades, even if it came in a smaller dose than at home. As he walked off the stage, Nicky Wire held up a fan-made sign alluding to that night’s penultimate song and the feeling in the building. It simply read: You Love Us. This entry was posted in emiguel and tagged esteban miguel, live review, manic street preachers. Bookmark the permalink.